A while back, I talked about the University of Wisconsin's remarkable tradition in linguistics, especially historical linguistics, stretching back over the last century. We've now lost a major link in that chain: Winfred P. Lehmann passed away on August 1. In addition to the LINGUIST notice, the Linguistics Research Center (LRC) at the University of Texas, which he led for decades, has posted a note, here. Professor Lehmann earned an MA in Germanic Linguistics and a PhD in the same field here in 1941. 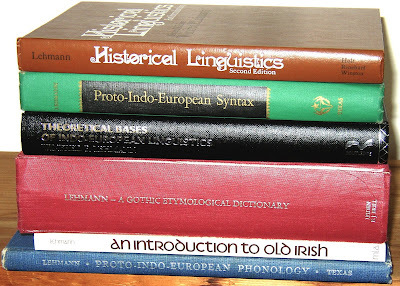 He was one of the most prolific linguists of the 20th century and made particularly important contributions to Germanic philology and linguistics, Indo-European studies and linguistic typology — with publications running from 1940 until last year, and even this year, with his on-line Grammar of Proto-Germanic. I believe he was the only person to serve as president of both the Linguistic Society of America and the Modern Language Association (when they included 'language' and not just literature, a day which may come again). Heavily involved since the early days in what was then known as 'machine translation', he was committed to using technological innovations, and the LRC has done significant work in web publishing, including posting classic works in historical linguistics. His passing is a real loss, and sorely felt here in Wisconsin. "Truly a giant in our field", as a colleague just said. A real loss, indeed. I was *always* in awe of what he knew and what he did.